Lacresha Berry, better known as Berry, is a singer/songwriter, actress, poet, educator, and writer from Queens by way of Lexington, Kentucky. She received her BA in Theatre from the University of Kentucky. She honed her playwriting skills there and went on to produce three one woman shows since 2002. Her last one woman show, "Browngirl. Bluegrass." documented her life as a brown girl coming of age in the bluegrass state of Kentucky. She's performed all over the country with the show as well as singing and hosting all over NYC. Her latest one woman show, TUBMAN, a reimagining of Harriet Tubman’s life as a young girl in Harlem, debuted to packed audiences in her hometown of Lexington, Ky, and NYC, with additional performances in San Diego, Rikers Island, New Bedford Massachusetts, Sacramento and Tubman's birthplace in Cambridge, MD. When she's not performing, she's teaching spoken word to middle and high school students in the Bronx, conducting educational workshops, and writing curriculum. She is currently writing her debut YA novel, "Seeing Janelle"
an autobiographical story of its star and creator Berry - examines the rarely documented cultural history of African-Americans in Kentucky. Berry blends the perspectives of her own childhood through Kentucky geography and personal events while honoring the work of important ancestors whose lives parallel with her own. Her take on the culture, geography and the history of Kentucky is poignant, didactic, and enlightening as we see the historical figures of our enriching and emotional past come to life with ancestral music to soundtrack these powerful stories. 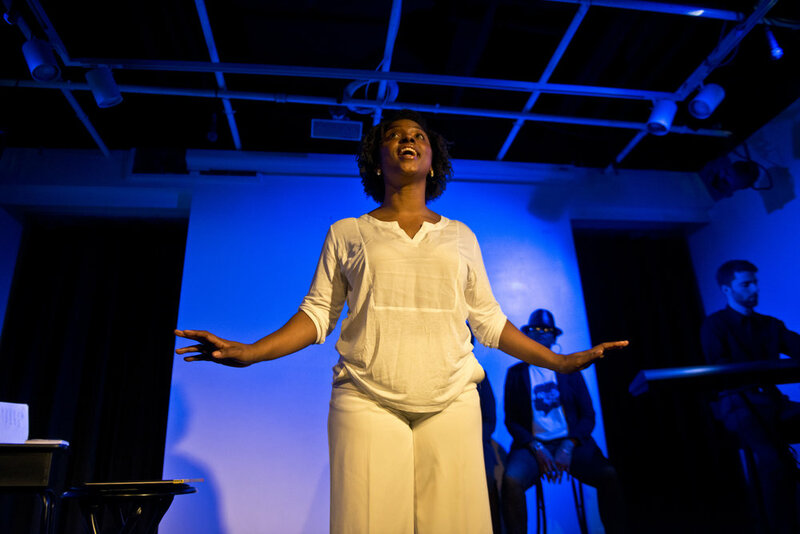 A one-woman show with seven original songs that evoke the ideas of womanhood, family, love and race, as well as push universal themes and intergenerational messages in every piece of poetry, prose, and song. A historical adventure and homage to her heritage and ancestors, BrownGirl. Bluegrass. teaches us that we are all beautiful and powerful. THE HISTORY OF BROWNGIRL. BLUEGRASS. Presented by Berry & Co., the show is directed by Shauna Horn with music composed by David Cohn and lyrics by Lacresha Berry. Following a successful New York premiere in Harlem at the Dwyer Cultural Center in 2014, BrownGirl. Bluegrass continued its big city jaunt at the Midtown International Theatre’s, Midwinter Madness Short Play Festival, as part of the Gallatin Arts Festival #BlackLivesMatter Series Finale at New York University, The Secret Theatre in Long Island City and to a sold out audience at Dixon Place. The show has also made its debut in Washington D.C. at the National Conference on Race & Ethnicity in American Higher Education (NCORE), played multiple shows down south where the story takes place in Lexington, KY at the Lyric Theater and continues its higher education tour at institutions such as Amherst College in Massachusetts and Asbury University in Wilmore, Kentucky. This one woman show presents the story of Harriet Tubman reimagined as a young woman growing up in Harlem through a theatrical lens. Harriet Tubman is a heroine and American legend in her own right. This session will take the story of Harriet in the 19th century and places her in the 21st century; laced with the problems facing African-American youth all over the country. And especially focusing on the mistreatment of black girls in schools. What would happen if a young woman like Harriet became a leader in this new world? Would her struggle be the same? Would she know her power? This play examines the centuries old fight with race, gender, and equality through a theatrical lens centered around the most influential woman leaders in American history. Poetry, monologue, and revolutionary music will aid in telling young Harriet's story. It would benefit students and leaders searching to find their voice and searching to take an active role in defining their place through social justice theater in this racially divided country. I learned of Harriet Tubman superficially in high school and college. I knew she was a famous conductor on the underground railroad but I didn’t know she was a mother, wife, scout, spy, and fighter for the lives of elderly people. I have been researching her life for the past year or so and discovering her many sides compelled me to take on telling her invigorating story. So, I took matters into my own hands and developed a unique perspective as a teacher in Harlem. How would the youth hear this story in a new and modern way? Even though she lived from 1820-1913, the issues that plagued her, still plague us today. In the brilliant words of Chimimanda Adichie, author of “Half a Yellow Sun”, “There’s danger in a single story.” In other words, learning about Harriet’s many roles and complex layers adds to the story of her illustrious life. She’s not a monolith as I once imagined. Hearing only about her strength is merely one sided. This image was solely designed and created by Kon Boogie for one woman show, TUBMAN, written by Lacresha Berry. WHO WOULD HARRIET BE TODAY? So, I took matters into my own hands and developed a unique perspective as a teacher in Harlem. How would the youth hear this story in a new and modern way? Even though she lived from 1820-1913, the issues that plagued her, still plague us today. Feb. 17th and 18th, 2017: National Debut at The Lyric Theatre; Lexington, KY.
March 27th, 2017: NYC Debut at Dixon Place; New York, NY. May 18th, 2017: Presented at UGRR Conference, Harriet Tubman Visitor Center; Cambridge, MD. June 28th-July 2nd, 2017: World Beat Cultural Center, San Diego Fringe Festival; San Diego, CA. June 16th, 2017: Queens Library Teen Center at Far Rockaway; Far Rockaway, Queens. July 29, 30, 2017: International Conference on Penal Abolition, University of Massachusetts; New Bedford, MA.